Beautifully sited with sweeping country views in all directions. Minutes to Chapel Falls, the DAR and Ashfield Lake. This property has been meticulously maintained and updated by the current owners who have lived there 45 years. Private back yard with good southern exposure. Raised garden beds, open land and fenced in area for the dogs. Open floor plan with remodeled kitchen consisting of solid oak cabinets, oak floors, center island and Corian counters. Huge living room addition with tiled floors and french doors connected to a wonderful 28 x 12 composite deck for back yard bar-b-qs and entertaining. 2+ car garage has ample storage as well as 32'x16' second floor . Clean and dry basement could be finished for additional living space. New septic, water heater, wood stove, appliances and Low E windows. Ease of living in this low maintenance and energy efficient home. 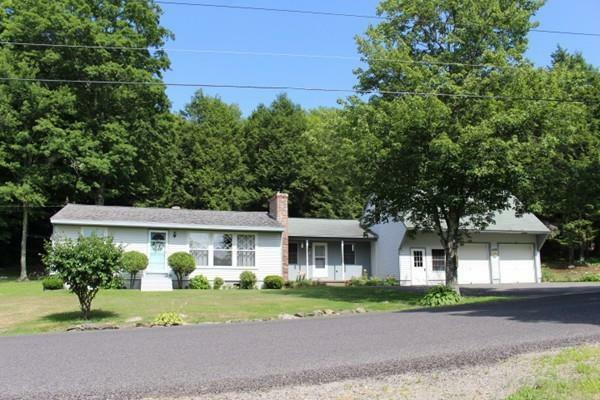 Set on a picturesque country road and only 30 minutes to downtown Northampton and Greenfield.